Note: If you need electrical or plumbing work, please use a contractor licensed for that service. School Locator. 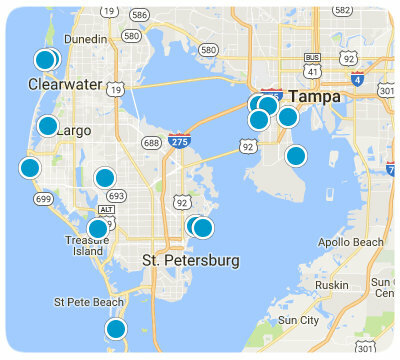 Find the school nearest you: Hillsborough, Pinellas, Pasco. Weather and Schools are two great reasons to move to Florida and specifically to move to the Tampa area. As a native Floridian I have to say I do love Florida’s tropical weather. Even though it can get really cold some winters the good news is; give it a day or two and the sun is shining and it is back to mild winter days. Frankly, for those of you that move here from up north you will probably feel you are on vacation all year round. Florida schools are competitive. We have a liberal program of school choice, where parents can usually pick schools within a school district. Plus, Tampa Bay has a large number of established charter schools and Florida private schools to choose from. Thank you for your confidence and trust in allowing us to represent you in your real estate transaction. Please call us when your friends and family have a need for professional real estate services.